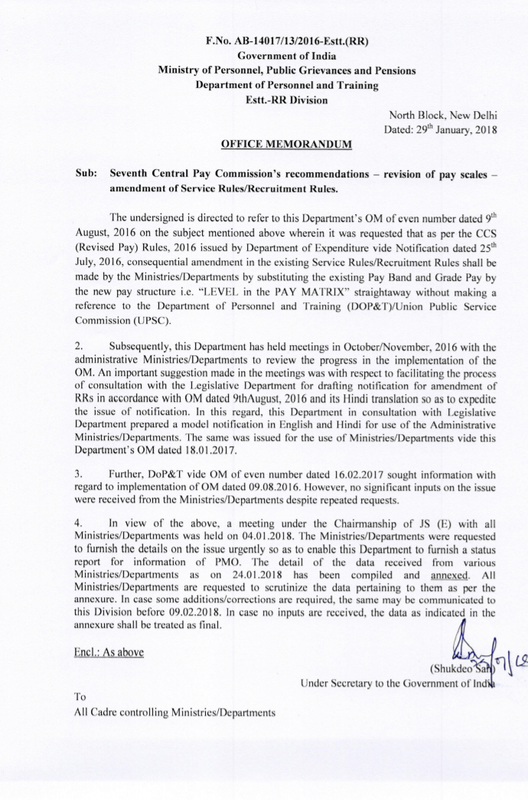 The undersigned is directed to refer to this Department’s 0M of even number dated August, 2016 on the subject mentioned wherein it was requested that as per the CCS (Rcviscd pay) Rules, 2016 issued by Department of Expenditure vide Notification dated 25th July, 2016, consequential amendment in the existing Service Rules\Recruitment Rules shall be made by the by substituting the existing Pay Band and Grade Pay by the new pay structure i.e. “LEVEL in the PAY MATRIX” straightaway without making a reference to the Deportment of Personnel and Training Public Service Commission (UPSC). 2. Subsequently, this Department has held meetings in October/November, 2016 with the administrative Ministries/Departments to review the progress in the implementation of the O.M. An important suggestion made in the meetings with respect to facilitating the process of consultation with the Legislative Department for drafting notification for amendment of RRs in accordance with 0M dated 9th August, 2016 and its Hindi translation so as to expedite the issue or notification. In this regard, this Department in consultation with Legislative Department prepared a model notification in English and Hindi for use of the Administrative Ministries/Departments. The same was issued for the use Of Ministries/Departments vide this Department’s 0M dated 18.01.2017. 3. Further, DoP&T vide 0M of even number dated 16.02.2017 sought information with regard to implementation of OM dated 09.08.2016. However, no significant inputs on the issue were received from the despite repeated requests. 4. In view of the above, a meeting under the Chairmanship of JS(E) with all Ministries/Departments was held on 04.01.2018. The Ministries/Departments were requested to furnish the details on the issue urgently so as to enable this Department to furnish a status repot for information of PMO. 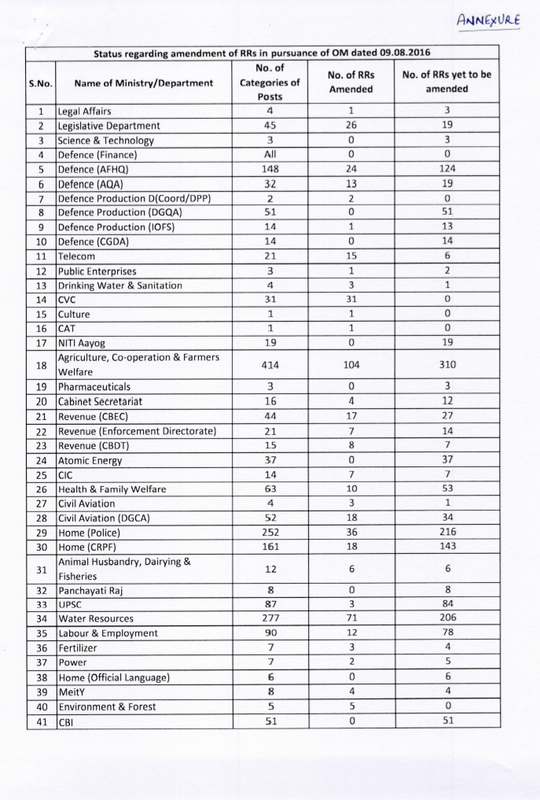 The detail of the data received from various Ministries/Departments as on 24.01.2018 has been compiled and annexed. All Ministries/Departments are requested to scrutinize the data pertaining to them as the annexure. In case some additions/corrections are required, the same may be communicated to this Division before 09.02.2048. 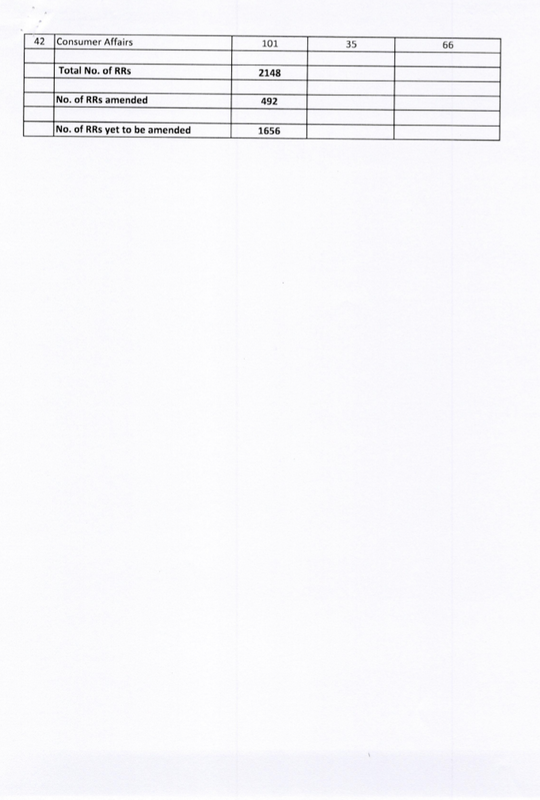 In case no inputs are received, the data as indicated in annexure shall be treated as final.